Shifting freight transport mode from road to others such as rail and waterways has caught attention of policy makers around the world. Policies aimed to encourage and facilitate the modal shift of freight transport have been initiated in several countries. The main arguments for promoting the modal shifts are that rail and waterways are more environmental friendly and more economical than road. This thesis focuses on the cost argument and proposes a method to determine the distance where the modal shifts will between transport modes will be economical. 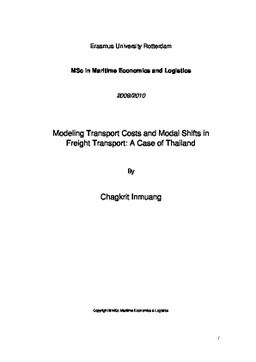 Transport costs in this thesis are determined using a case study of transporting a twenty-foot container from a warehouse in Ampher Nakorn Luang, Ayudhaya Province to Laem Chabang Port to generalize transport costs of road, rail, and inland waterway of Thailand. The result reveals that average transport costs per kilometer are THB 24.33 for road, THB 8 for rail, and THB 7.06 for inland waterway. However, unlike road, rail and inland waterway transport usually requires additional handling activities at transfer nodes and first- and last-mile transport to bridge between user premises and transfer nodes which creates extra costs. As a result, the additional costs of modal transfer are THB 1000 for rail, and THB 1160 for inland waterway, while the cost of bridging transport depends on the distance of between the user premises and the transfer nodes. This thesis proposes a model based on transport costs which is capable for determining the points where different transport modes have equal costs. The model is developed on the basis of traditional cost model but adopts cost data as inputs rather than freight rates, and the model is constructed in a form of linear equation to enable accurate determination of intersects. With the inputs from the case of Thailand, the model suggests that road is the most economical mode for transporting a twenty-foot container for less than 105.93 kilometers, rail is the most economical mode for the distance between 105.93 to 170.21 kilometers, and beyond 170.21 kilometers, inland waterway has the least transport cost when assumes 30 kilometers of bridging transport. Although the model is presented using cost data and figures from the case study, the concept is generalized and thus can be adapted to an analysis in a different context. Finally, the model is applied to an infrastructure development project for railways and inland waterways in order to promote modal shifts of freight transport in Thailand. From the samples of 20 provinces with highest Gross Provincial Product, there will be reductions of more than 20% of transport costs if the freight transport is shifted from road to rail in the routes between Laem Chabang Port and Ayudhaya , Saraburi, Khon Kaen, Nakhon Rajasima, Songkla, Nakhon Pathom, Chiang Mai, Nakhon Sri Dhammarat, Surat Thani, Rajaburi, Khampaeng Phet, and Lamphun and between Bangkok and the following provinces: Rayong, Khon Kaen, Nakhon Rajasima, Songkla, Chiang Mai, Nakhon Sri Dhammarat, Surat Thani, Rajaburi, Kamphaeng Phet, and Lamphun, and from road to inland waterway in the route between Laem Chabang Port and Ayudhaya, Pathum Thani, Nonthaburi, Bangkok, and Samut Sakhon.